Was Felix Baumgartner’s jump the unofficial kickoff to the age of space tourism? Felix’s one-man jump leads the way and builds hype for layman-friendly space programs like Virgin Galactic and Blue Origin, which didn’t even need to play sponsor to score the inadvertent promotion. When Felix Baumgartner leapt his way past the sound barrier Sunday, one thing was clear: The Space Age isn’t over; it’s just beginning and people are excited. 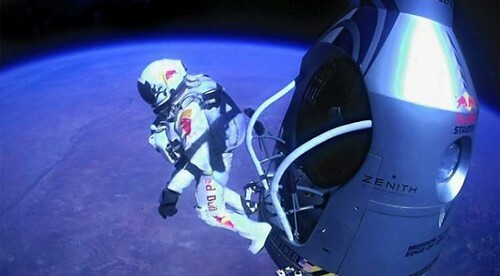 Over 10 million views tuned in around the world to watch the epic jump. Photo by Cyril Attias. Baumgartner’s stunt, like those of the 1960’s Space Race, reignited an interest in the great playground beyond. And for those deep-pocketed adventurers who’ve climbed Mount Everest or set foot on Antarctica, it’s clear there’s only one place left to go: Up, up and away. Now, players in the space tourism industry…are reminding us that more humans will enter space than did during the entire space shuttle program when Virgin Galactic, Blue Origin and Space X launch in the coming years.